The After School Education and Safety (ASES) Program is the result of the 2002 voter-approved initiative, Proposition 49. This proposition amended California Education Code (EC) 8482 to expand and rename the former Before and After School Learning and Safe Neighborhood Partnerships Program. The ASES Program funds the establishment of local after school education and enrichment programs. These programs are created through partnerships between schools and local community resources to provide literacy, academic enrichment and safe constructive alternatives for students in kindergarten through ninth grade (K-9). The after school program believes that we, as humans, must foster and develop existing traits and talents in an effort to be better humans for a better world. More importantly, we must continuously make the effort to embody humility, demonstrate compassion, and show love. These character traits are amongst many that make us strong humans and responsible citizens of our world. By developing and strengthening one’s character traits, one can improve the quality of their life as well as positively impact relationships and personal growth (VIA Institute on Character, 2015). According to Tom Rath (2015), we must be able to identify and strengthen our already existing abilities to become more productive people and live happier lives. 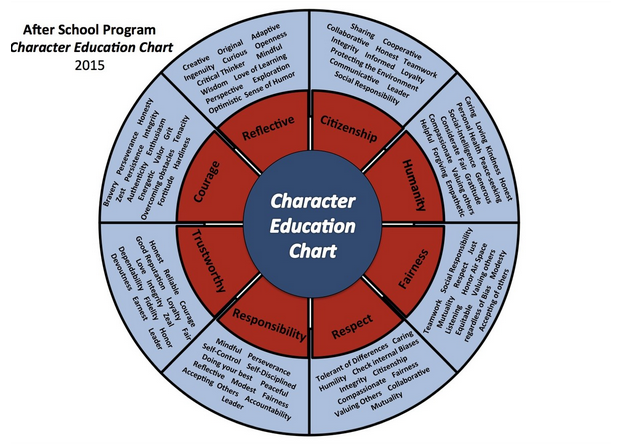 The after school program’s approach to character education is through the intentional learning of character traits in and out of the classroom. Each month, students will dive into a character trait using various multi-media to understand its depth of meaning and make connections to self and to the world. The goal is to provide our students with the opportunities to explore positive traits (what they look, sound, and feel like) as well as to provide them with the language needed to describe and embody their traits and talents.